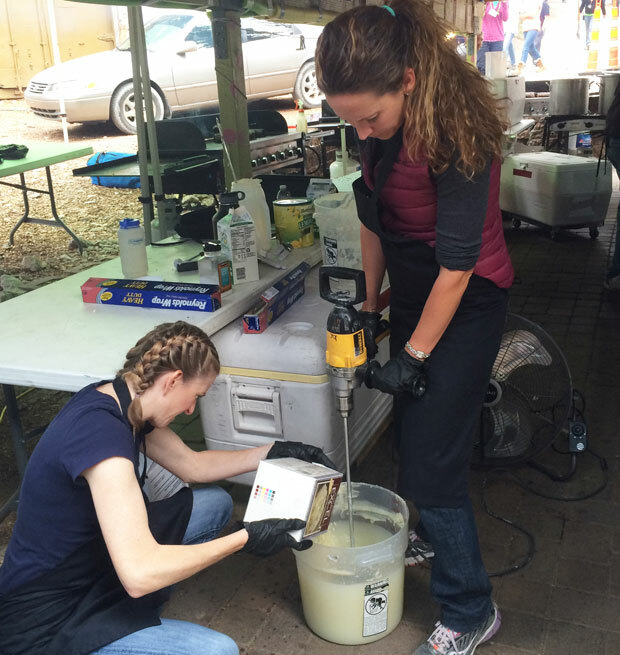 Last week, Jason and I had the opportunity to serve as volunteer cooks for our church’s annual youth girls’ camp. It was our daughter’s first year to attend, so it was fun to see her there and make sure she was having a good time, but not hover. And boy, did we work our tails off! It was good, fun service, though. When you have a bad hair day from not showering at camp, just wear a wig! The theme for this year’s camp was based on Dr. Suess and went something like this, “Oh the places you’ll go and the service you’ll do.” So naturally Jason and I had to ham it up and get into character. 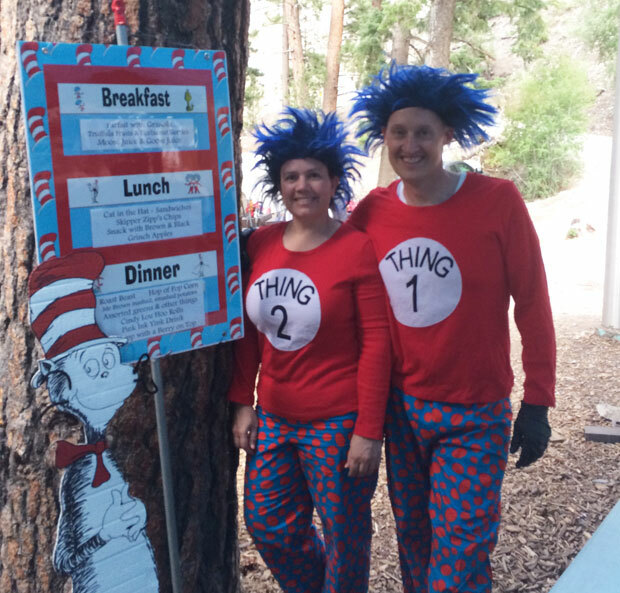 We wore our Thing One and Thing Two costumes while we helped serve Roast Beast for dinner on one of the nights. 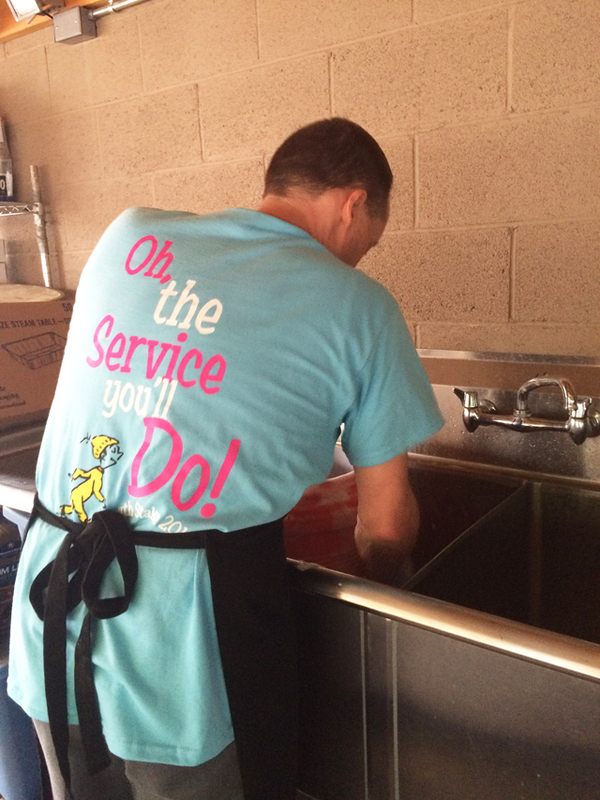 Washing dishes for 250+ girls was no small feat. Thank goodness there were lots of helpers! 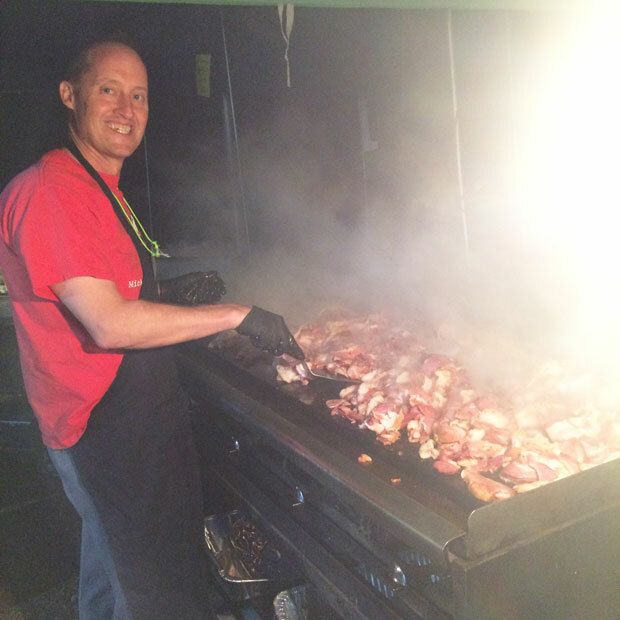 And Jason had a great time cooking ALL THE BACON for a delicious breakfast of egg burritos with all the toppings! One of the benefits of helping on the cooking crew was being able to sample before, during and after each meal!! To say we were well fed is an understatement. 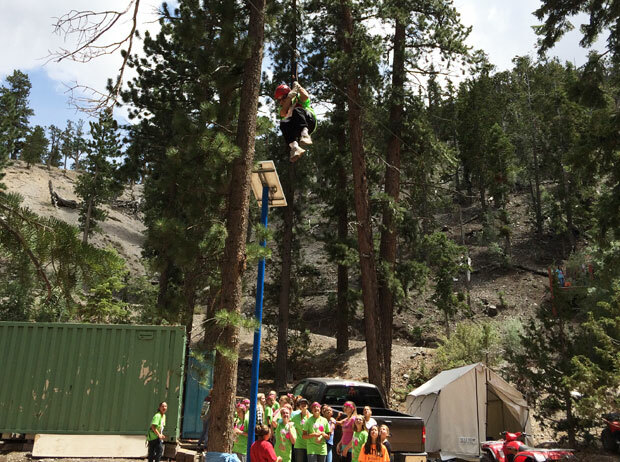 While we cooked, cleaned, and cooked some more, the girls participated in scheduled activities like first aid, crafts, camping skills and several fun physical activities like zip lining. Our daughter’s favorite activity was zip lining. We are not surprised at all! The craziest part of our week was on the last full day of camp. 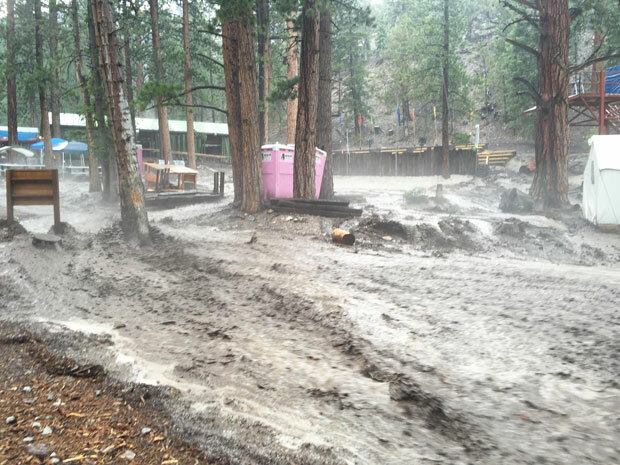 Just after lunch, a torrential flash flood swept through camp, causing us to evacuate for safety. There was muck and debris everywhere and the girls had to wade through mud up to their knees to get to higher ground for safety. Flash floods are common in Las Vegas – they come quickly and without warning! Fortunately, due to quick thinking and good leadership from those in charge, there were no injuries and all made it down the mountain safely. Other than a few tears, the majority of the girls were proud of the story they could now tell and are already looking forward to next year’s camp. Yes, I will volunteer for treats! 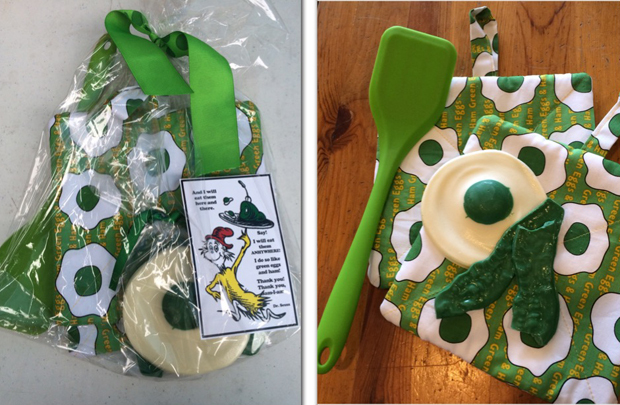 The white chocolate version of green eggs and ham were divine! I love the line: you can never have too much bacon! Too true. Looks the week was busy (250 girls!) and exciting as well, due to the flash flood. Bravo to you for your service. Thanks for sharing, loved the pics. Surely understand about the flash floods, have daughter living off Grand Teton, got stuck over there last year. Christa, thank you so much to both of you for volunteering for this duty! I remember how important camp was for me many years ago and for my 2 now-grown kids fewer years ago. Looks like you both really got into the spirit of the camp. And why wasn’t I invited to the great bacon feast, Jason? Looks like you really know how to work that griddle! Did you all have to dig through the muck to get your things after the flood passed? Last a lifetime. You are truly an inspiration! OH WHAT A WONDERFUL THING TO DO WITH HUSBAND AND CHILDREN I ENVY YOU SO MUCH, BUT MY CHILDREN ARE ALL GROWN UP AND THEY DIDN’T HAVE WONDERFUL THINGS LIKE THAT WHEN THEY WERE SMALL. Looks like you had a fun time at camp. I attended a Girl Scout camp many years ago. Instead of the last day of camp, our storm hit the first night. The largest destruction came when nearly 2 feet of soppy mud ended up in the swimming pool. By the time they shoveled out the pool, refilled it, and let the sun warm it (no heaters back then), we never got to go swimming. What a disappointment since I came from a small town and we didn’t have any pools. So glad the week wasn’t ruined for you all.